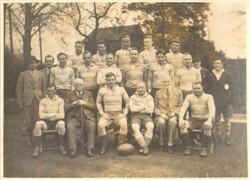 Olney RFC 1st XV, black and white team line-up photograph season 1937-38. 15 named players in kit: S. Dix, A. Field, J.T. Bradley, A. Perkins, S. Kitchener, R. Horne, J. Walden, R.A. Tomkins, C. Osborn, S.J.D. Skinner, J. Packwood, H.S. Good, A.P. Bell, J. Millward, S.E.F. Petts), plus 6 officers: S.F. Morgan (Chairman), E.F. Robinson (Committee), R.M. Sargent (Hon Sec & Treasurer), H.J. Simcoe (Committee), J.C. Hipwell (First Captain, 1877), Dr C.L .Chevalier (President). Information above photo: Season 1937-38: 60th season. Season’s Record: Played 31; Won 16, Drawn 1, Lost 14. Scored 439 points, against 298 points. Photograph by M.T. Kitchener, Newport Pagnell.